Take Cous Cous in a bowl,add pinch of salt and boiling water. Cover the Cous Cous with boiling water until it immerse. Cover the bowl with plate and let it be for 20 minutes. Seperate the grain with fork, so it becomes pluffy. Now Cous Cous is ready and add carrot, cucumber and onion. Mix well and add mint, red chilli and cherry tomatoes. Its time to add Olive oil and lemonjuice and mix well. Now check the seasoning,and add salt to it. Pepper powder can also be used to enrich the spiciness. Hmmm yummy Cous Cous Veggie Salad is ready to serve. I sprinkled out the ingredients above the salad to show that are used in Cous Cous Salad. Cous Cous Veggie Salad can be made with your own combination of veggies . It can be served for evening snacks and breakfast. Good idea for a salad! lovely salad and very healthy too. 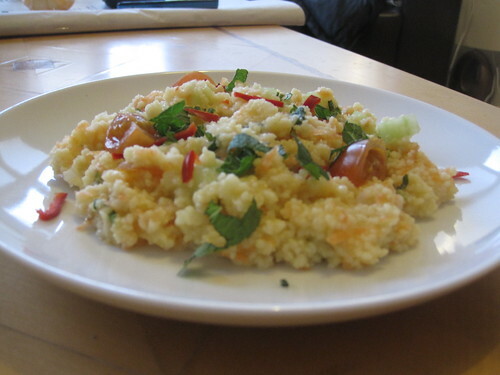 I love couscous as it is so easy to cook (or make since technically there is no cooking involved.) Your salad looks delicious. Salad looks absolutely filling and yummy.. The theme of marathon is itself very healthy and this salad is great. Salad seems so healthy n delicious. Nice one dear. This looks so good. Love the colors. That's an interesting recipe lla..will look fwd to your other entries..! 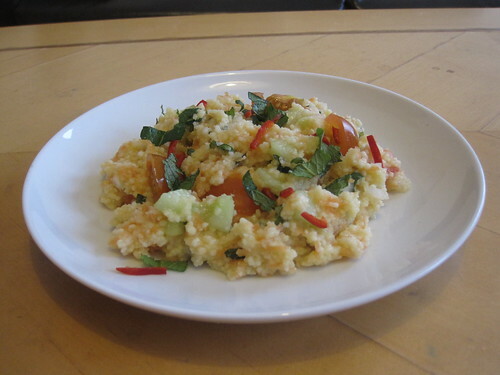 Different recipe with couscous. Another one in my to-do list. Thanks to all for ur lovely feedback..